Have you heard of Trim Healthy Mama yet? This plan is sweeping the internet as a healthy way to lose weight and get sugar out of your life! I have been eating about 50% on this plan for a few months now, and it is amazing. I still take my ACE G2 for energy & appetite control, while THM helps me eat the right foods for my body. Yes, it is a little pricey. I couldn't even find a cheap used copy! But it is so worth it. I know I can spend that for a meal for us, or on drinks throughout the week, etc. But they are gone right after I buy them. This book will last forever, it is an investment in YOU! You can also purchase the book from the THM website, where they also sell plan approved sweeteners, flours, and other ingredients. After you read the book, you will have a basic understanding of how to separate your fuels. E meals contain carbs, and are Energizing. S meals have fat, and are Satisfying. You don't eat carbs and fats together. By eating this way, your blood sugar doesn't spike. Your metabolism revs up! Facebook has some great groups devoted to THM too. I am in several, including the THM Beginners group. I learn so much from these women who have met their goals or are on their way! I am a fan of muffin in a mug recipes. They are so quick: assembled and cooked in less than 5 minutes! My favorite is an S recipe (well, actually 2 recipes) that I found online and tweaked to make my own. 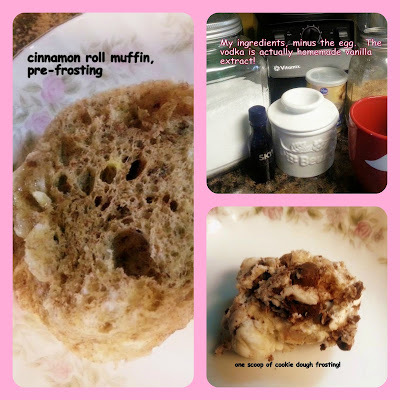 This is a quick, satisfying breakfast for me, and my kiddo likes it too. Note: you will probably not LOVE this at first. Our bodies are used to sugar! It's in everything. This is sugar-free and is made with nut-based flour, so it isn't like a cinnamon roll from the bakery, or a can. It's got the flavor of one, but in a healthy recipe! I didn't care for many recipes while I was detoxing from sugar and too many processed foods. I crave these healthy recipes now, and I think they taste better than the others - mostly because I don't crash after eating this, and I don't feel stuffed and gross after THM meals. Give yourself time to adjust to sugar-free! Things taste so much better when you take that out. Trust me! Original recipes I started from are here and here. 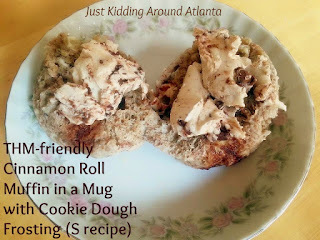 (If you choose to use the original cinnamon roll recipe linked here, it is an E recipe, so you can't frost it with the frosting I make from the 2nd recipe, as it is an S recipe!) Once you read the book, this will make sense! Melt butter in mug in the microwave (20 seconds is how long mine takes). I like to roll the mug around a bit so the butter coats the sides of the mug. Set mug to the side. Mix your dry ingredients in bowl, Add egg and vanilla and melted butter and mix well. In another small bowl, mix together cinnamon and sweetener. Add about a third of the wet mixture into the mug, then add about a third of the cinnamon mixture over that. Repeat this step two more times, until both mixtures are used. This gives it that "cinnamon swirl" that cinnamon rolls have. Microwave on high for about 1 1/2 minutes. Slide the muffin out onto a plate. Then cut in half and add frosting onto each half. Notes: I like to mix up individual batches of the dry ingredients in snack size baggies. Then I just add the egg and vanilla, mix well, and pour into the buttered mug to cook. Makes breakfast a breeze on busy mornings! I also make up a big bag of the cinnamon/sweetener mixture, then take out what I need when making this. I also use it for other THM recipes! Oh, and in the picture of ingredients right below, you can see my Butter Bell. We love it - our butter stays soft and spreadable and it's an adorable little crock. They come in many colors and designs. I use butter often, so this was a great investment! Let this sit in the fridge to set up a bit, then you can add a schmear to each half of your finished Cinnamon Roll. I love the cinnamon, caramel and chocolate flavors together. Feels like I'm eating a decadent dessert! I usually have this with either Bulletproof Coffee, iced black coffee with stevia and heavy cream, or a big mug of Good Girl Moonshine! You can find the first and last recipes on Pinterest. I will have posts with mine up soon! Notes: I used Hershey's Sugar Free Chocolate Chips (not on plan, but all I had) to make these today, but you can find Lily's Dark Chocolate Chips sweetened with Stevia (on plan) at stores (I've heard they can be found at Sprouts or Whole Foods). I have ordered them online. They are $12.99 a bag from Amazon, but this 4-pack is what I'm getting next, it will last you forever (well, almost!). It's a bit cheaper to buy them this way, plus shipping is free! I like to make this dip and chill it in the fridge for a while. Once it's set up, I use a melon baller to scoop out individual balls of the dip, and freeze them in a large ziploc bag. I set one or two out before I make my Cinnamon Roll, then use it for the frosting once done. However, my son thinks they taste fantastic as a frozen snack, kind of like a cheesecake bite. If you have any questions about THM, leave me a comment and I'll do my best to answer. I'm still a newbie myself, but I love living mostly sugar-free thanks too Trim Healthy Mama! And if you want to order Saba's NEW ACE G2, just leave a comment with your email and I'll message you! Disclosure: Affiliate Links in this post! This looks so delicious. I have never thought to combine the two flavors into one. This definitely looks tasty. I'm going to have to give this recipe a try.